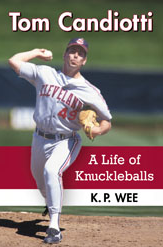 Welcome to A Life of Knuckleballs, the official website of former Major League Baseball pitcher Tom Candiotti’s 2014 biography! “Tom Candiotti: A Life of Knuckleballs” can now be purchased from the McFarland & Company website or through Amazon.com. For a list of McFarland’s Spring 2014 new titles, click here. Their sports 2014 catalogue can be found here, and it contains a discount code that can be used for purchases up until September 1, 2014! For a list of McFarland’s current titles, click here. For a list of their baseball biographies, click here. For the latest updates from McFarland, follow them on Facebook as well as on Twitter!